Many public infrastructure agencies have outmoded governance structures and procedures. They are still subject to political influence and weighed down by bureaucracy – characteristics that militate against institutional independence, efficiency and accountability. In fact, many public agencies assume both policy and implementation roles, a process that conflicts with the good governance principle, namely the separation of control and management. In such cases, institutional public-sector reform is strongly advisable, either through corporatization or professionalization of the agencies managing infrastructure assets. Corporatization is the process by which a public-sector department is transformed into a distinct legal entity (with the government as owner), whose assets, finances, and functions are segregated from other government operations. Corporatization aims to capture the advantages of a privately run company, including productivity, streamlined processes, commercial orientation and financial sustainability, while remaining accountable to the public and serving the public interest. Professionalization likewise involves adopting many aspects of private companies, but without changing the agency’s legal status. Corporatization also enables a more flexible system of shared ownership between different government levels and departments, and allows for easier transfer of ownership in the future, including privatization. Establish a separate legal entity and sound corporate governance. Specify strategic direction and clear objectives, as well as clarify roles and responsibilities. Spell out the limited, arm’s-length nature of departmental control over the newly corporatized entity. And, avoid duplication of activity between the new organization and the department sponsoring it. Ensure the organization’s managerial independence by granting it considerable freedom of action. The entity will be successful to the extent that it keeps politics out of its policies, and maintains sound corporate decision and planning horizons of more than one election cycle. Retain some control. The new entity has to stay externally accountable (to the government, or rather to the electorate); it needs incentives and targets to reinforce its performance goals, while at the same time not being micromanaged. The best way to bring that about is by contract – whether through a licence, performance agreement, service-delivery agreement or shareholders’ agreement. The contract should contain the agreed obligations of each party (in particular, specific financial and operational targets set by the government departments); the reporting and monitoring requirements; and any incentives, penalties, ministerial intervention and approval rights, such as for the business and financial plan. For example, the Sydney Water Act allows the regulator to demand remedial action, impose monetary sanctions and even terminate the licence for the corporatized entity. Introduce modern financial management and accounting practices. Set clear financial targets and policies related to cost recovery, profitability, dividends and subsidies. Give the new entity full control of financial matters, including investment, financing and pricing (within the regulatory limits), to ensure financial sustainability. In contrast to a government department, which often is managed as a cost centre and so has little incentive for superior performance, a corporatized entity is managed as a profit centre with its own revenue streams. For such an entity, the key source of funding is no longer government transfers but customer revenues generated through services, meaning it will have strong cost, revenue, investment and service-quality incentives, and will treat consumers accordingly. Implement dual-entry corporate accounting, and decision-making frameworks based on net present value, to ensure an unbiased budget allocation for construction and maintenance based on a whole life-cycle view. Set up an adequate and transparent financial reporting system to enable internal controls through the board, external independent audits and easily accessible information for the general public. Institute customer and commercial orientation. Commit to the customer via a customer charter or a formal customer contract. The National Water & Sewerage Corporation of Uganda has a customer charter that specifies service standards. Another example is the operating licence for Sydney Water, which includes schedules for customer service that set out the rights and obligations of both the corporation and the customer. Monitor and report on customer satisfaction targets. Sydney Water is required by the terms of its licence to accurately measure, record and annually report its performance against specified customer service indicators to the regulator. Establish data-driven management, and nominate capable leadership. Establish a transparent framework for setting targets, monitoring performance and prioritizing measures. For example, the Municipal Finance Management Act of South Africa requires production of a Balanced Scorecard for Johannesburg Water. Motivate staff through a remuneration scheme, career progression and personal performance assessments. In 2004, Singapore’s PUB moved from tenure-based fixed incremental pay increases to a system of performance-based or merit-based pay increases. Reforms of the institutional framework should extend beyond individual agencies, and should also address the need for more coordination and cooperation between agencies. Coordinate across assets and different levels of national, regional and local government. In many countries, responsibilities for operating and maintaining infrastructure are fragmented across different levels of government and jurisdictional boundaries. Individual regions or even municipalities might be assigned responsibility for a large share of the infrastructure, and might well give their regional interest priority over national interests. Develop metropolitan or regional infrastructure plans to coordinate the O&M and rehabilitation plans. For instance, in a regional airport system as in Paris and London, each airport could be assigned a particular role – catering to full-service, low-cost or cargo carriers – to enable specialization and economies of scale. Establish a designated coordinating institution, and define clear roles and responsibilities for all other agencies involved. The EBRD has coordinated changes of tariff structures and public service contracts by taking an integrated, multicity approach across 20 cities in Tajikistan. If appropriate, enter into performance contracts with regional or municipal subsidiaries to hold them more accountable, increase managerial autonomy, introduce performance incentives and increase coordination across the system. Design budget allocation mechanisms across different levels of government wisely. In many countries, the federal government supports regions and municipalities in financing new infrastructure, but there are often no appropriations for O&M and rehabilitation. (This system encourages myopic decisions that favour the option receiving the greatest federal support, rather than the one with the lowest life cycle costs). Integrate system operations. In public transportation, for example, the various modes can be better coordinated by integrating information, fare systems and networks. Seek and exploit cost synergies in maintenance and rehabilitation. For instance, a “dig once policy” aims to synchronize various works that require road excavation, such as installing broadband fibres, renewing the paving and upgrading water, sewer or electricity systems, by coordinating across agencies and utilities. Harmonize technical standards. For example, the European Rail Traffic Management System enables rail interoperability across borders, and thus reduces international rail traffic costs. Harmonize regulations, such as truck operator registration, vehicle fitness and vehicle overload control. In some cases, of course, such coordination and cooperation might still prove insufficient, and an integration of activities, and thus mergers, will be needed to optimize joint operations. Merge agencies to optimize scale and scope. In some countries, infrastructure is characterized by small and potentially inefficient management units, owing to a fragmented municipal structure or a complex system of local, regional and federal assets. Of the 150,000 public water supply systems in the US, more than 93% are very small, each serving fewer than 3,300 people.201 Consolidating operators is thus one way of enhancing the ratio of overhead to operations and achieving an efficient scale and scope. Mergers are most beneficial when the assets in question are homogeneous; the economies of scale and scope are large; the network effects are pronounced; and some individual parts of the businesses are unprofitable and reliant on cross-subsidies. However, demerging of agencies may be indicated in some cases when increasing complexity outweighs the benefits of scale and scope. The present time offers a good opportunity to sell brownfield infrastructure assets on favourable terms. Many government budgets are still constrained in the wake of the global financial crisis, while institutional investors have large amounts of private capital at their disposal. Encouraged by the current low-interest-rate environment, these investors, notably pension funds and insurance firms, are seeking low-risk, long-term and inflation-hedged investments such as infrastructure. They are particularly interested in the O&M phase, as the main risks have already been resolved; namely, the most difficult to manage, early-life-cycle risks – design, construction and ramp-up of demand. Currently, there is considerable dry powder available for infrastructure investment in OECD countries. The 145 unlisted infrastructure funds collectively reached an all-time high in October 2013, seeking global aggregate capital of US$ 97 billion. Yet recently, the number of deals has been flat relative to the past five years, suggesting a “money chasing deals” phenomenon. Investors are paying high prices – witness the recent privatization of ANA Aeroportos de Portugal – and that means a potential concession or sell-off opportunity for the public sector, enabling it to recycle capital into new infrastructure assets, to pay down debt or to expand social services. Governments need to proceed with caution, however – for their own sake and for that of the users. By simply aiming to maximize the proceeds of privatization (“monetization deals”), a government could be consigning its citizens to disproportionately high user charges, and restricting its own flexibility for the long term. Review the private participation options thoroughly. Clarify the policy objectives. On the one hand, there might be an interest in safeguarding public-sector control of the asset’s operations and future development; on the other, there are the economic objectives of improved operations and investment decisions. These competing considerations will become part of the calculation when deciding which option to favour. Assess stakeholder readiness of the private sector (whether sufficient competition and skills are present), civil society (how acceptable private participation will be) and government institutions (what their oversight and regulatory capabilities are). Scrutinize any proposed private involvement, by means of a rigorous value-for-money analysis, to determine whether it really would be the most beneficial option for society (chapter 1.6). Private-sector participation has challenges of its own, related to higher costs of finance, regulatory failures, long-term inflexibility, labour transition issues and disregard of certain public objectives. 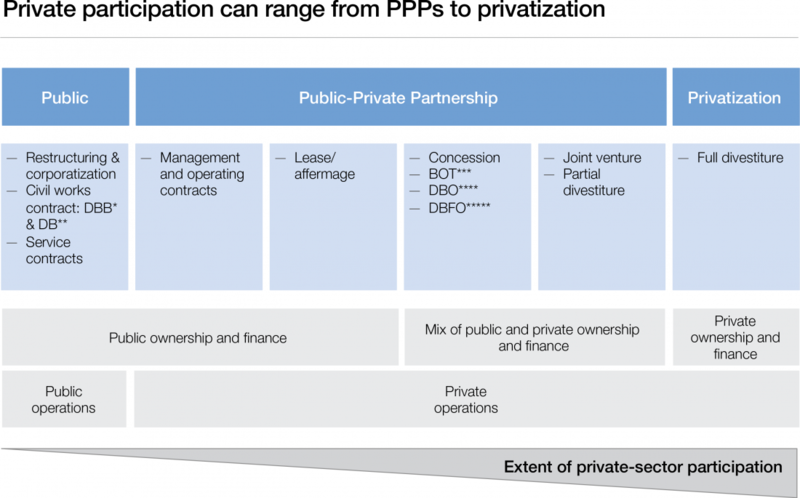 At times, merely the spectre of privatization will motivate public utilities to improve O&M performance, as was the case for many US public water utility systems. And public agencies can learn from their interaction with private-sector operators. For example, the Central Highlands Region Water Authority in Victoria, Australia was able to acquire new knowledge and skills from a PPP for a water treatment plant, and duly improved water quality in other water distribution areas.207 But if private participation is the way forward, governments should make proper provision for it beforehand. Engage in a restructuring or optimization programme prior to initiating the privatization process, to boost valuations and sell assets at a good price. Put in place the institutional and capability prerequisites for a productive relationship with the private participant. Even if most activities are outsourced, a strong and competent government involvement has to be maintained. Prepare for a fair, transparent and competitive procurement process. Consider amending the rules and regulations for foreign direct investment to enable both foreign and domestic investors to participate in the procurement to get the best deal for the government. Anticipate the public reaction. One way of securing public buy-in for privatizations is to reinvest the proceeds into new infrastructure (“asset recycling”). For example, the Australian government applied this concept of “social privatization” by selling Port Botany to public pension funds, with the express intention of devoting the proceeds to other public services. Devise a balanced risk allocation and an astute regulatory system. Private participation usually involves a regulatory or contracting arrangement for decades – a time frame during which major changes are possible in the service and the partnership. To weather the uncertainties and fulfil the expectations of both the public and private sides, much depends on the quality of the risk allocation and the system of regulating prices, standards of service, and investment. The fundamental objective is to strike a balance between attracting the private sector on the one hand, and safeguarding public interests and maximizing overall economic returns on the other – by allocating risks to the party best able to manage them. Increase investor attractiveness by sharing or mitigating difficult-to-manage risks (e.g. traffic volume) through sliding scales, guaranteed minimum offtakes or availability-based concessions. Protect the public interest by choosing a concession model and pricing regime that encourages the concessionaire to operate and maintain the assets efficiently; for example, through incentive regulation using benchmarks or the RPI-X formula (which increases prices only by the change in the retail price index as a proxy for inflation, minus a required efficiency increase), rather than the rate of return (cost-plus) regulation. If appropriate, protect the user interest by regulating the quality of service, using incentives such as bonus and penalty schemes. In the Netherlands, electricity network regulation includes compensation payments to customers for outage time. Consider market design reforms as well. As the academic literature shows, the efficiency of infrastructure services is enhanced not only by the ownership structure, but also by the market structure – to the extent that the latter facilitates competition. Different assets lend themselves to different forms or degrees of competition. For some assets, direct in-market competition is feasible; for instance, among ports or nearby airports. Sometimes only indirect competition is possible, as with intermodal competition between road and rail. In contrast, for natural monopoly portions of the value chain, such as rail and electricity transmission networks, the only competitive options are horizontal unbundling across geographies and for-market competition for the concessions. 195 Good Practices in Public Water Utility Corporatization. 2006. USAID. 196 The Turnaround Artist: Craig Coy Tackles Political Influence at Massport. November, 2008. Kennedy School of Government. 197 Corporatization – Commercialization Reforms in the Water Sector in Jordan. 2002-2009. USAID. 198 East African Infrastructure. Special Report. East African Infrastructure Development, Part I: The Central Corridor. November, 2013. Stratfor Global Intelligence. 199 “TMSA Supports Trade and Transport Facilitation Programme for COMESA-EAC-SADC region”. TradeMark Southern Africa, http://www.trademarksa.org/about_us/programme_news/tmsa-supports-trade-and-transport-facilitation-programme-comesa-eac-sadc-reg. 200 “Single market for gas & electricity”. European Commission, http://ec.europa.eu/energy/gas_electricity/codes/gas_en.htm. 201 “Blueprint for Integrating Technology Innovation into the National Water Program”. EPA, http://water.epa.gov/blueprint.cfm, 2013. 202 Interrelationship between the structural funds and the provision of services of general (economic) interest and the potential for cross-border service delivery. October, 2010. Brussels: European Parliament. 203 The Nordic State Road and Railway Infrastructure Market. 2013. Helsinki: Finnish Transport Agency. 204 Moore, M., Forster, P. “China to create largest mega city in the world with 42 million people”. In The Telegraph, 24 January 2011. 205 2012 Annual Report, Mapping a new direction. 2012. New York: The Port Authority of New York and New Jersey. 206 “Infrastructure to 2030 (Volume 2): Mapping Policy for Electricity, Water and Transport”. OECD, http://www.oecd.org/futures/infrastructureto2030/infrastructureto2030volume2mappingpolicyforelectricitywaterandtransport.htm, 2007. 207 Water Treatment Plants by Public Private Partnerships – Central Highlands Region Water Authority, Victoria, Australia. 2003. Efficiency Unit.